I hope you will enjoy it and if you have any questions about details, just ask in the comments! It is one thing to paint a single miniature and it's a completely other thing to begin a complex project. There should be a rough idea of what will happen, how it should look etc. This planing phase is pretty wild in my case, ideas get born just the be thrown away 5 seconds later. I'm looking for inspiration, talking very much with my friends about it that bring new ideas to the project and in the end you have some kind of rough sketch inside your head. At this point i want to give out a biiiiiiiiiiiig monkey hug to my brother in brushes, Roman that made my life more complicated with more and more ideas. In the next step i cut out a piece of plasticard with a size of 50x50mm which later gets put inside of the cut out gaming base. 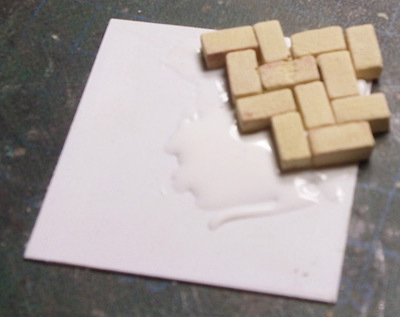 On this piece of plasticard i started glueing my small bricks in 1:35 scale (manufactured by Juweela). I glued them on the plasticard with pvc glue. The next step was to build up a anticlinal basement. To support the stairs i used a piece of balsa wood. On the backside of the scene i wanted to give the impression that it was 'ripped' from ground earth. To give this impression i cut out 2 pieces of plasticard to give a platform for the earth. On this platform i glued some flower earth with plastic glue. Watch out when you glue earth with super glue, sometimes it gives away hazardous vapors. Do it outside or with good ventilation and keep some distance with your face from the point of application! 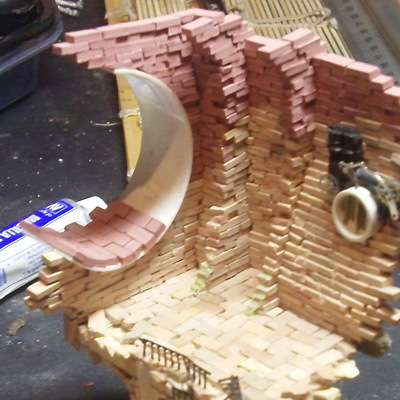 On the front side I continued to build the stairs, to do this I glued the small bricks with superglue to create a stair like construction. Between the stairs I added more balsa wood to give the stairs some support. On the top of the basement I added some floor for the next level with more balsa wood. 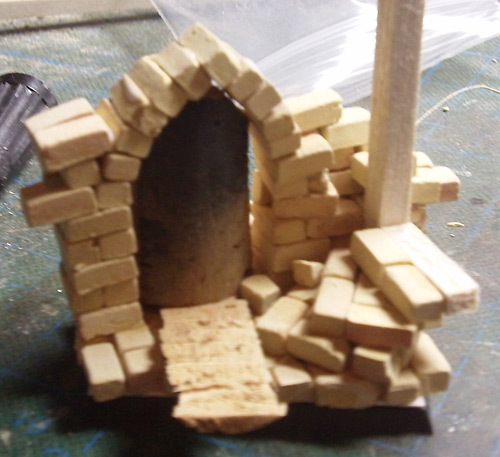 For the small arch I used smaller bricks. 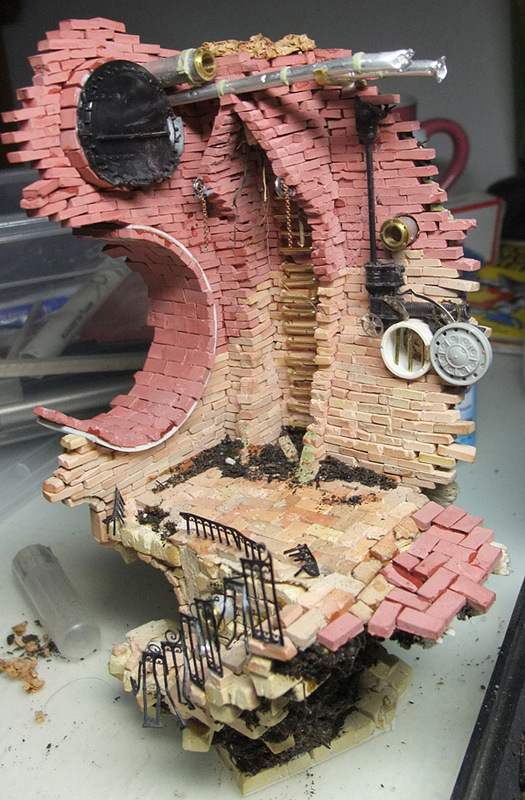 At the stairway I added some damage to the bricks with a scalpel and added a small barrel. 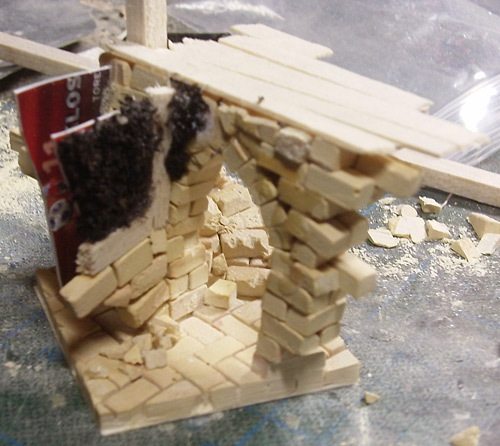 To add some more realism I used the remains of the destroyed bricks to add some debris to the corners of the stairs. 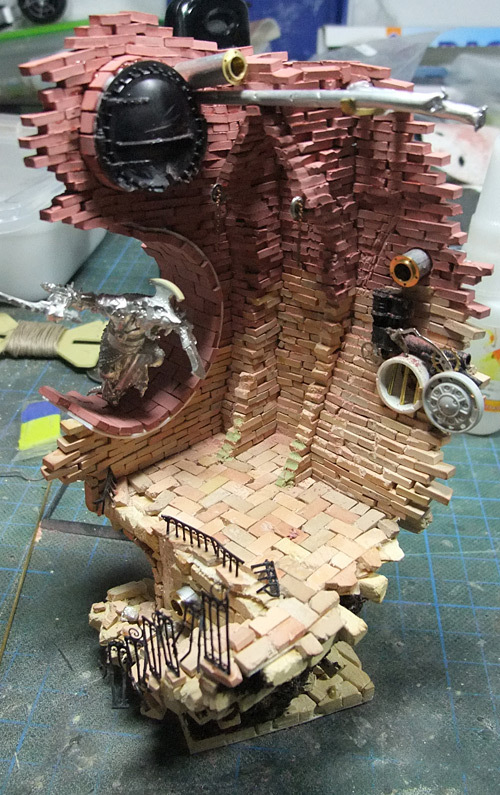 The wall in the first floor slowly started to grow, I just kept gluing bricks together with superglue to resemble a wall. 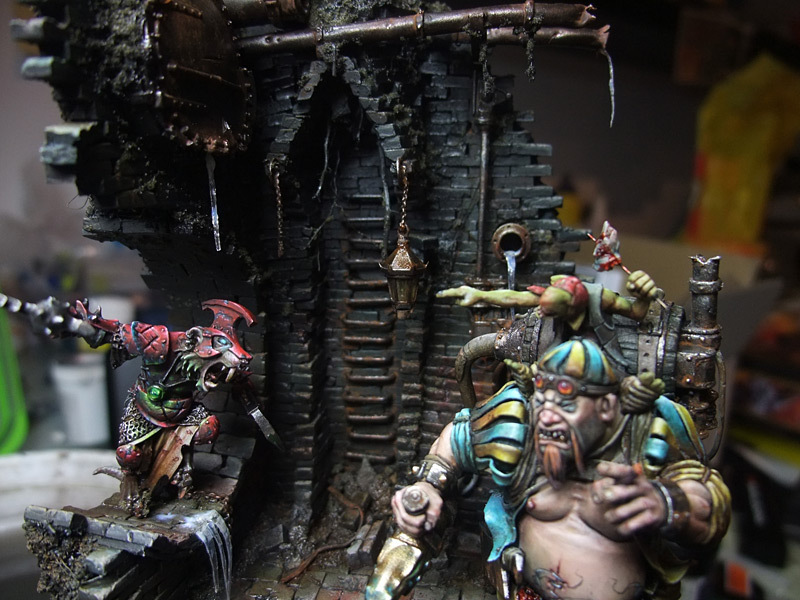 On the picture you already see the imagined poses of the two miniatures. A drain pipe was created from a piece of plastic tube and copper wire and was added to the wall. To give it some more detail I used parts of old automatic wristwatches and pieces of plastic models. 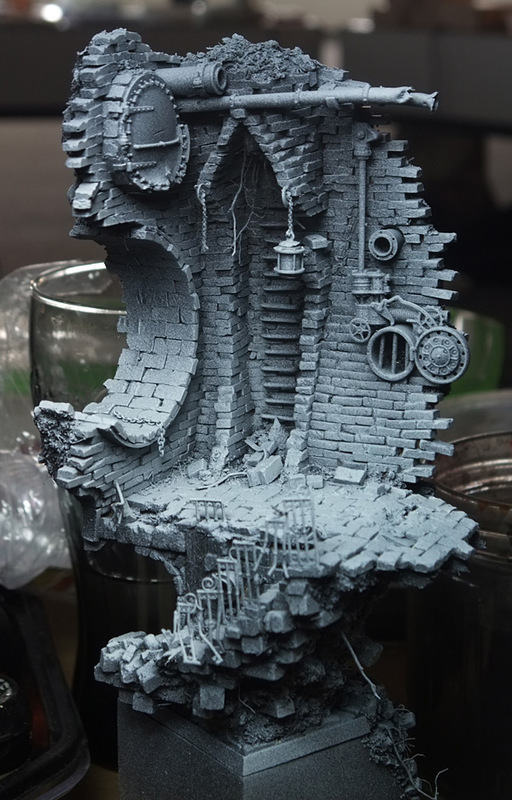 A basecoat spray cap was cut and used for the big sewer opening which the skaven should jump through. 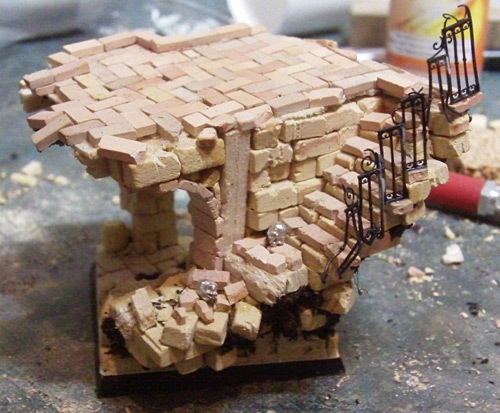 After adjusting it's size I integrated it into the base and glued bricks to it. The skaven was finally assembled and was fixed with Milliput where it was necessary like on the helmet and on the back. I added a pin to his foot to remove him for painting. On most of my projects I add a pin to the foot to have the miniature seperated for painting, but to have the option to 'stick' the mini on the base to get a feel for the overall look. Above the big sewer opening I added another sewer port. This part was from a plastic kit of a steam locomotive. The aluminium tubes on top got some dents and damage, the ends of the pipes were bull's-eyes from ship model making. I also added more damage to the brick wall. 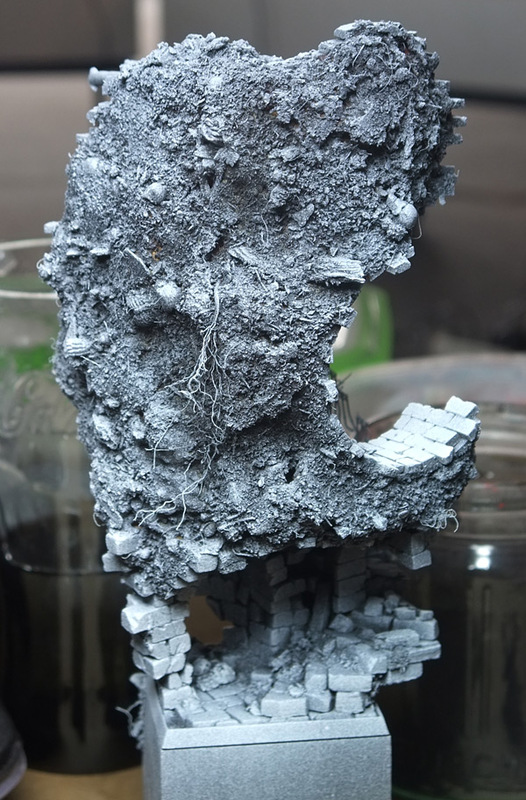 I glued some pieces of cork, skeletons and a base of flower earth to the backside of the wall with super glue. Then I used Milliput to fill up the empty space between the cork pieces. I used a small stone to add some structure to the Milliput while it wasn't hard. 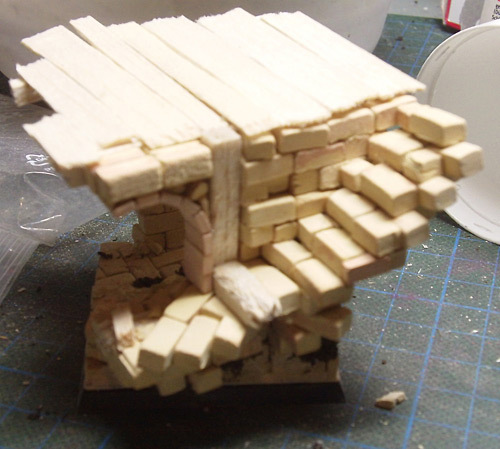 As the base was somehow a little too small for the ogre, I enlarged the floor with some balsa wood and small bricks. On the backside I added more detail with more roots, earth and small stones. On the front side of the base I added some earth to the floor mixed with some loose bricks. Some trash on the front and a small lantern bring the base to an end. Here you see the basecoated version. As the base is so far finished I can now start with the conversion of the ogre. 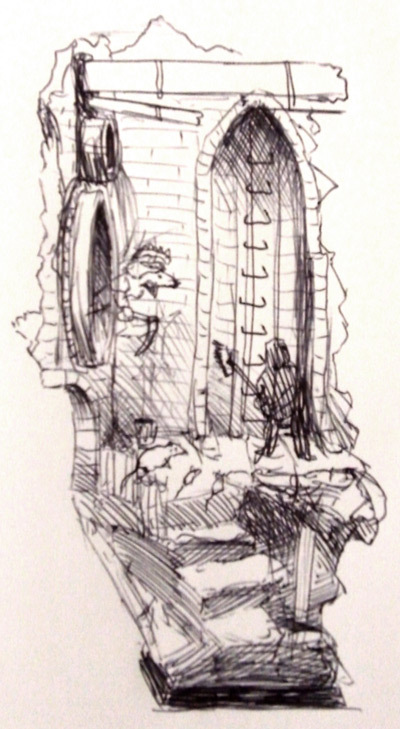 Again I started with a sketch to bring the picture in my mind to the paper. 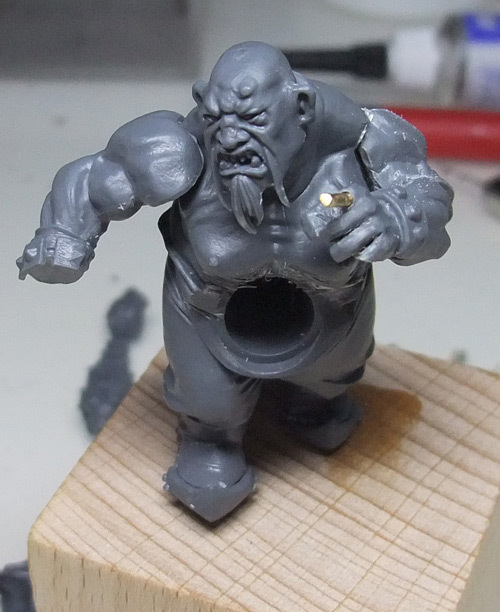 I started the conversion with a basic body from the Ogre Bulls box from Games Workshop. 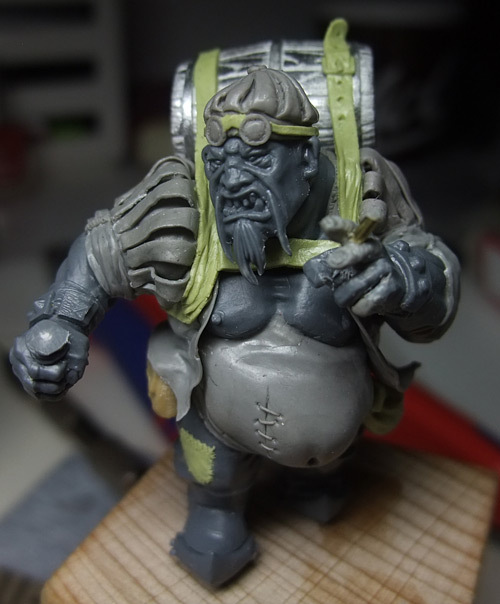 The first step was to assemble, remove mold lines and change the belly of the ogre. The fingers of the left hand were modified to be able to hold a cigar. 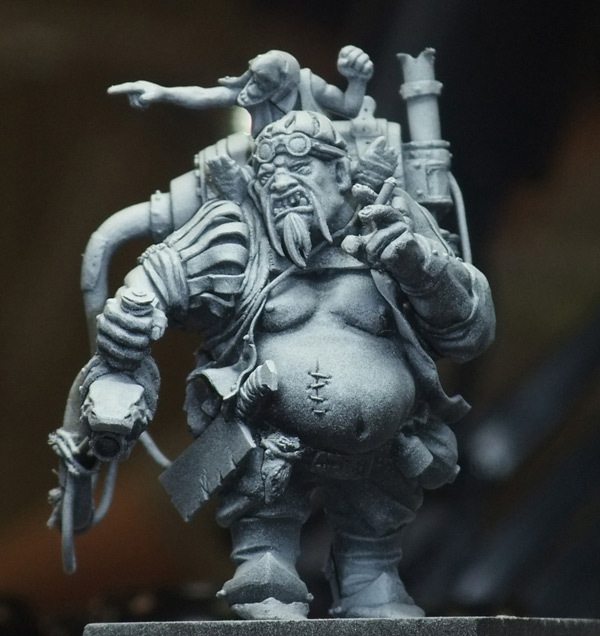 According to this theory I started with sculpting the belly using Pro Create mixed with 1/5 of Super Sculpey Firm to get a longer working time (this trick also works with Green Stuff instead of Pro Create and with Fimo instead of Super Sculpey). The clothing was added on the next day. The bag is from a plastic kit of 1:35 soldiers. 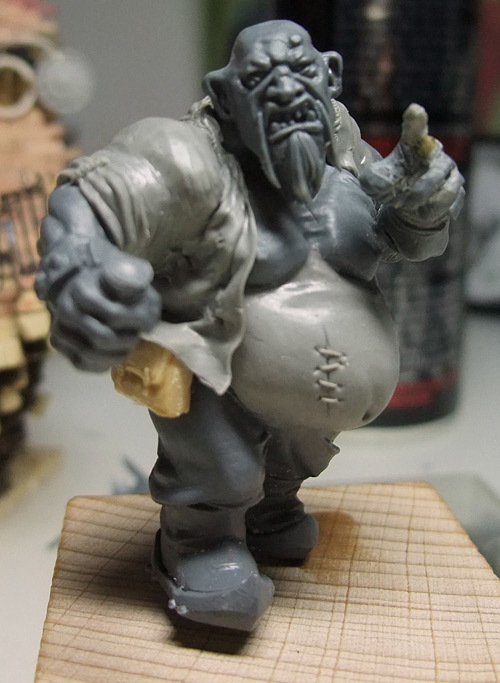 When sculpting on larger projects it's always a good idea to work in layers, start with the most inside layer (skin) and work to the outside (clothing, details). 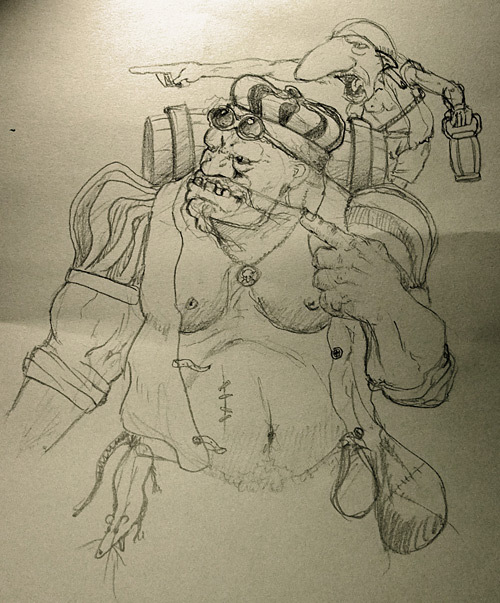 As the ogre should resemble a mercenary I decided to give him some lansquenet style. I made strips of Pro Create on baking paper and attached them to the cloting. I also sculpted a fitting cap with Pro Create. 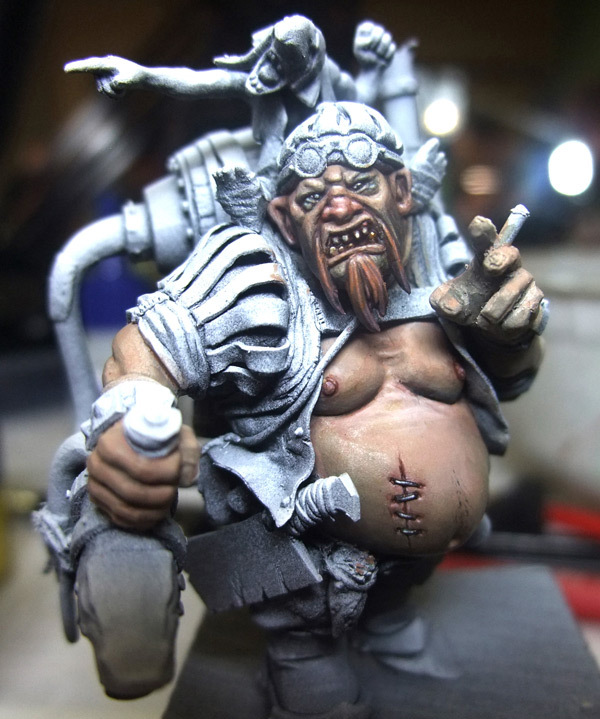 When the clothes were dry I sculpted the fingers and the cigar. 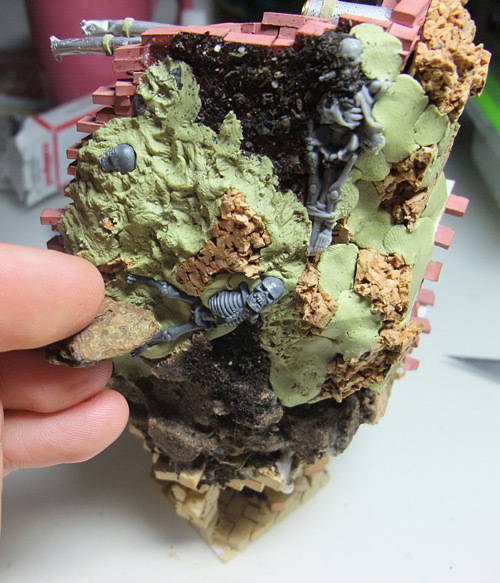 After everything was dry I sculpted the belts of the backpack/flamethrower tank with Milliput (Why not Pro Create? I don't know...). The barrel itself is a tin on I got as a gift from Roman. After the belts were dry I cared about the gnoblar. The base model is the gnoblar that sits on the banner in the Ogre Bulls box. The legs of the gnoblar got cut off at the hip and after the glueing them to the body of the ogre I reattached the gnoblars body to the legs. The gap was closed with Milliput. 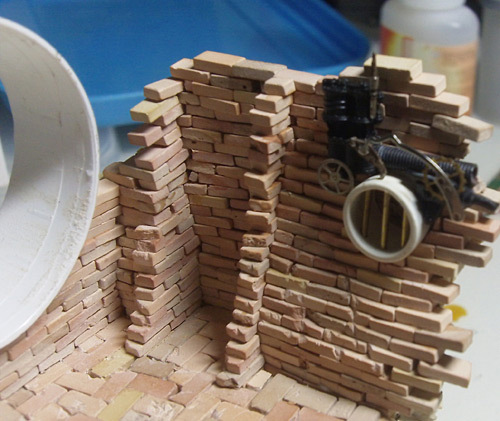 On the sides of the flametank I attached parts of plastic kits like a part of a tank wheel. The flamethrower was made from a piece of aluminum tube and the end of a Chaos Space Marine Heavy Bolter. The rings around the flamethrower were sculpted with Milliput. To create the hose that connects the flamethrower to the tank I rolled up a sausage of Milliput on backing paper and brought it into position after a small drying time (not completely dryed, just not so sticky). After completely drying I could remove the hose again to sand it to perfect shape. When I finished this step I created another smaller hose made from tin-solder and added it to the bigger hose with some fine thread. 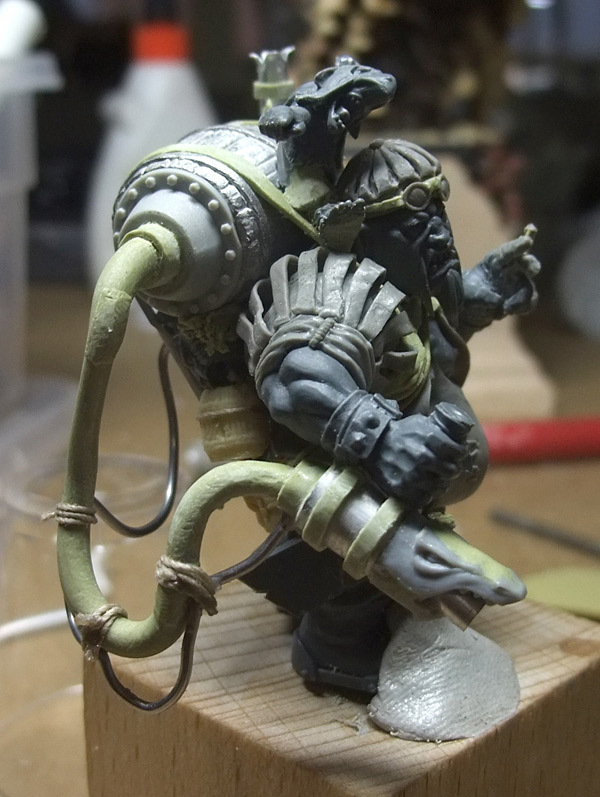 After the conversion work was done I basecoated the ogre with a 2k basecoat. The whole scene was painted in a zenithal lighting style, you can read more about this here. 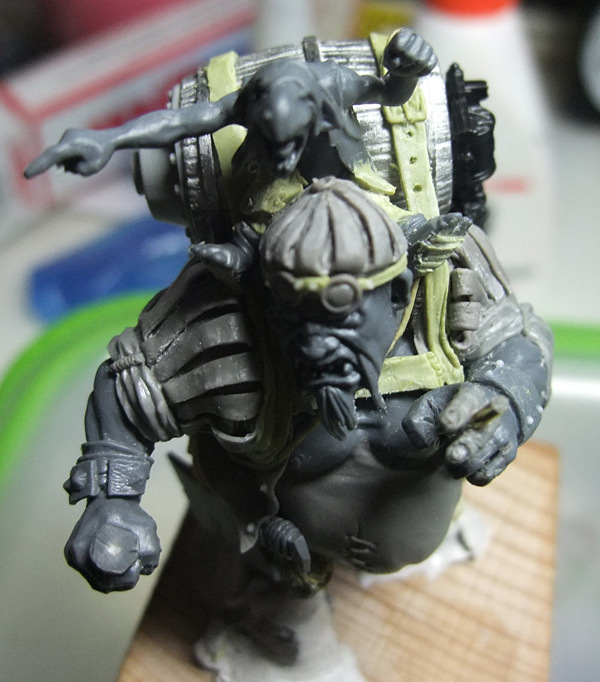 The skin of the ogre was painted with a mix of Fortress Grey and Tallarn Flesh as a midtone. After this I added some light by mixing Bleached Bone into the midtone. For the shadows I added a little drop of Dark Angels Green, Codex Grey and Chaos Black to the midtone mix. The blendings were painted with many layers of thin glazes to get a nice result. For the red parts of the skin like the nose, ears, ellbows, scars and cheeks I added a little bit of Terracotta (old GW color) to the color. 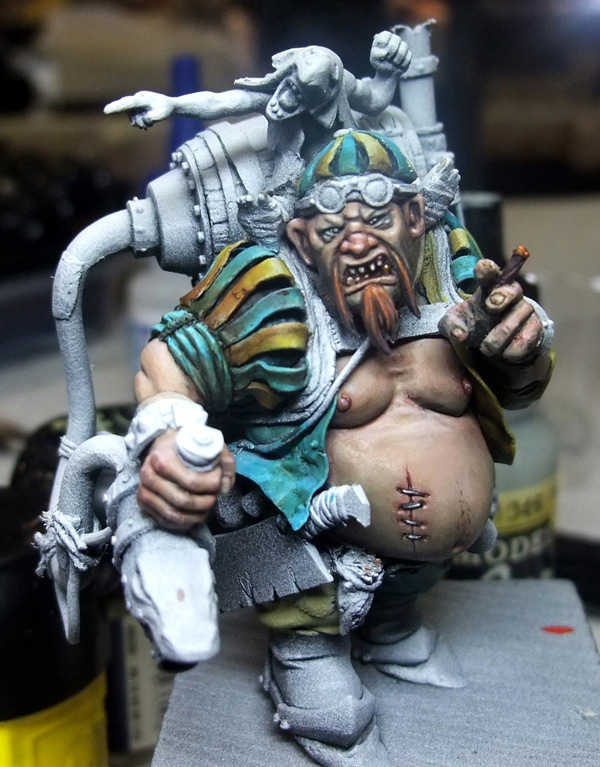 I added this color in glazes to get a smooth blending to the rest of the skin. Under the eyes I added a small glaze of Hawk Turqouise. The beard shadow and the belly hair were painted with Uniform Grey (Vallejo). I painted the inside of the mouth with a mix of Chaos Black and Tank Brown (Vallejo). It's a good idea to paint the inside of the mouth right after the basecoat. It's hard to paint it at the end withouth painting on the finished skin. The beard was painted with a mix of Blazing Orange and Codex Grey. On the clothing I really tried to get some nice color contrast while not being to bright and colorful. I got some inspiration on real lansquenet clothing and so in the end I used yellow and turquoise. For the yellow I used a midtone of Iyaden Darksun. For the shadows I added Sepia Ink (Vallejo GC), the lights were painted with Rotting Flesh. For the turquoise I used a mid tone of Hawk Turquoise, the shadows and lights were painted with Sepia Ink and Rotting Flesh, just like the yellow. I did this to reduce the contrast between the two parts of the clothing and to bring both colors together to get a nice overall look which much contrast but without the colors biting each other. After the big Surfaces I painted leather parts, wood and metal. 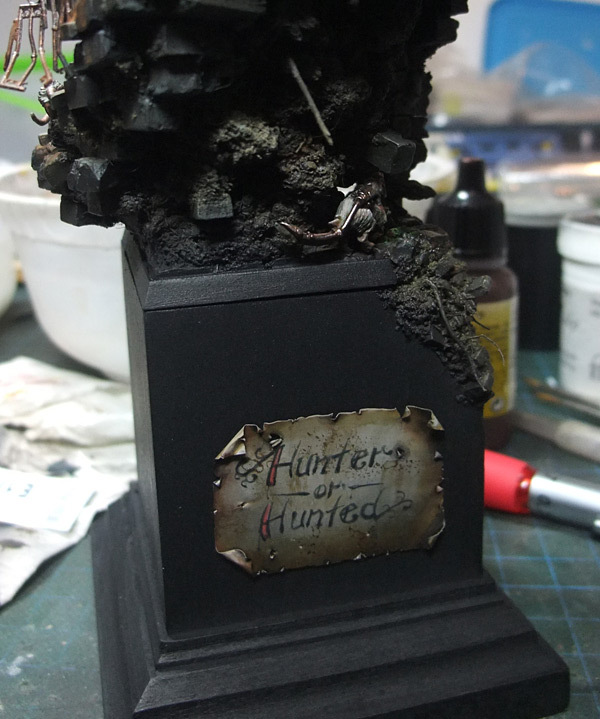 For the leather I mainly used a basecoat of Graveyard Earth mixed with a variety of other brown colors. I used Tank Brown to bring in some shadows and Bleached Bone for the highlights. The metal parts were given a base coat of Tin Bitz and depending on the type of metal they got a different finish. For the golden parts I used Glorious Gold (VGC) and Silver (Vallejo Model Air) for the highlights. The shadows were painted with glazes of Sepia Ink. For the iron parts the recipe was almost the same, I just left away the gold and the shadows were painted a lot darker with Chaos Black. To create the rust I used my own rust pigments. 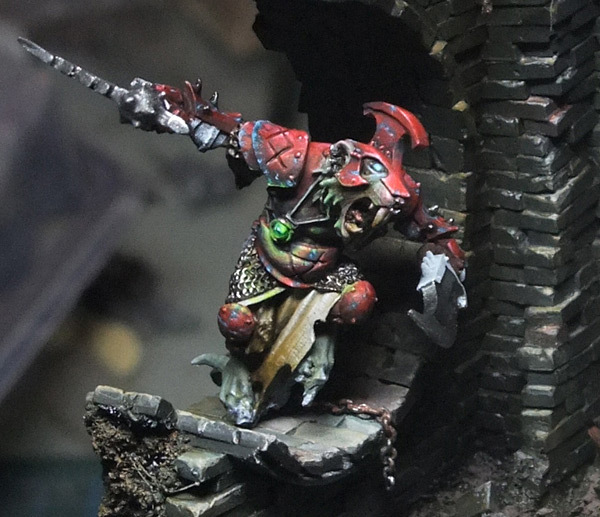 On the skaven I wanted to create a really nice powerful red that would not totally get blown away by the strong color contrasts on the ogre. For the red I used Blood Red which was darkened with adding Hawk Turquoise to the mix. The small light spots were painted with a mix of Blood Red and Dwarf Flesh. I brightened it even more with smaller spots of Dwarf Flesh and in the end the brigthest spots got a small dot of Ivory (VMC). As rust is not a good contrast to the red armor I decided to create another type of oxidation effect with Hawk Turquoise. The cape was painted with Bleached Bone and Sepia Ink was again used for the shadows. The eye and crystal were painted with a strong contrast to the armor, Scorpion Green. 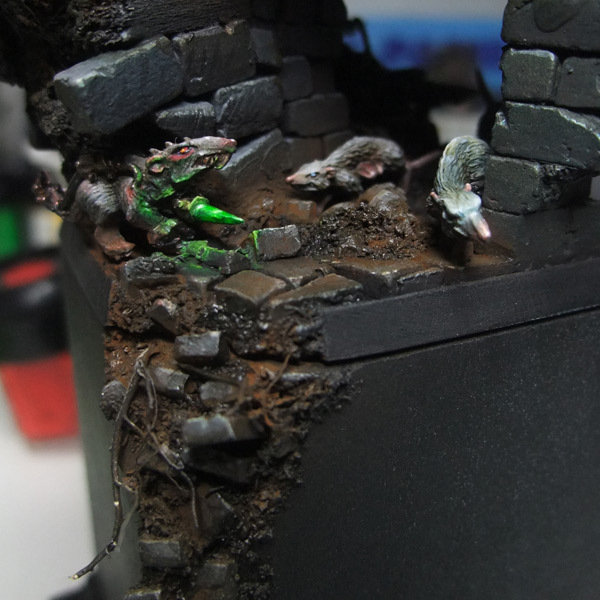 After the skaven was finished I started painting the base. 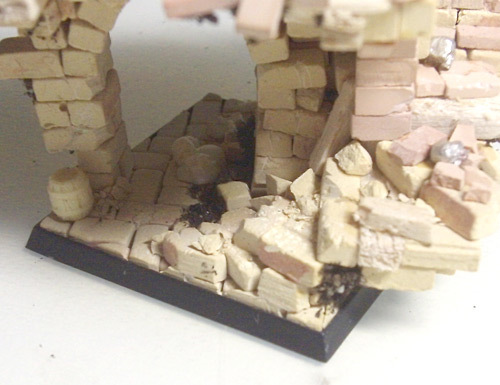 I started glazing different brown tones including Sepia Ink and Tank brown on the basecoated bricks. To get a little color variation I glazed single bricks with terracotta. The lights on the bricks I painted with Rotting Flesh and white. To bring out single bricks I added shadows with Dark Sea Blue (VMC). I painted the metal parts like on the oger and added some home made rust. 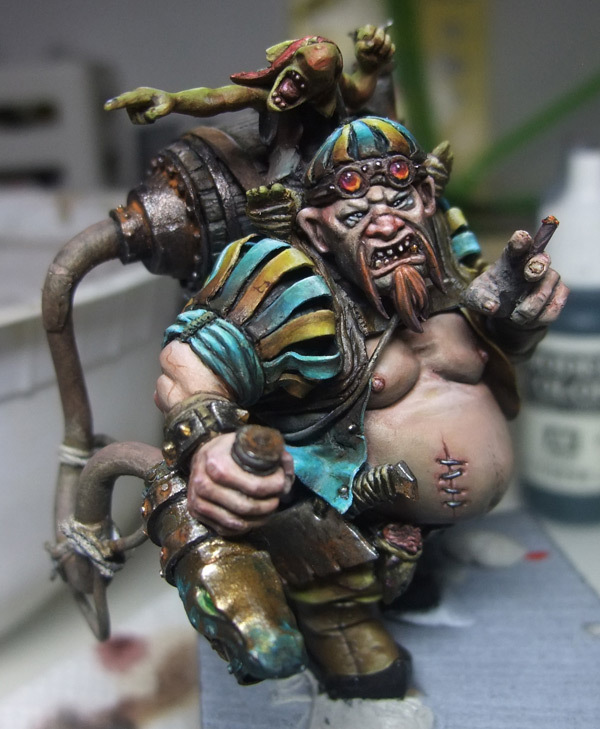 For the bright rust spots I used some pigments from MiG. 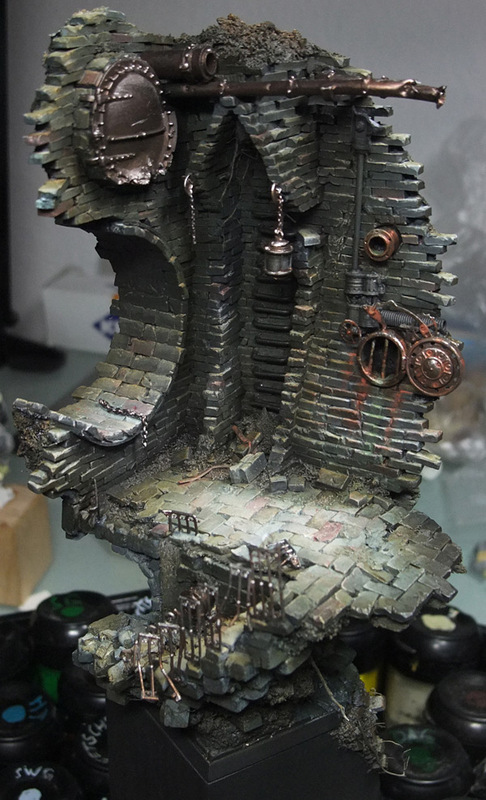 After the base was almost finished I used some pigments from Jester Miniatures to give the base some color variance and give it a dusty look on some parts. I just spotted the pigments on the base dry with a big bristle brush. 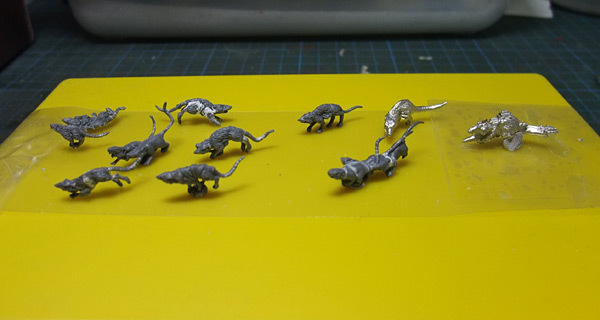 To bring some more life into the base I used different kind of rats from Games Workshop. Some of them got a little conversion work to give them more dynamic and running poses. To basecoat them I sticked them to some reversed sticky tape. 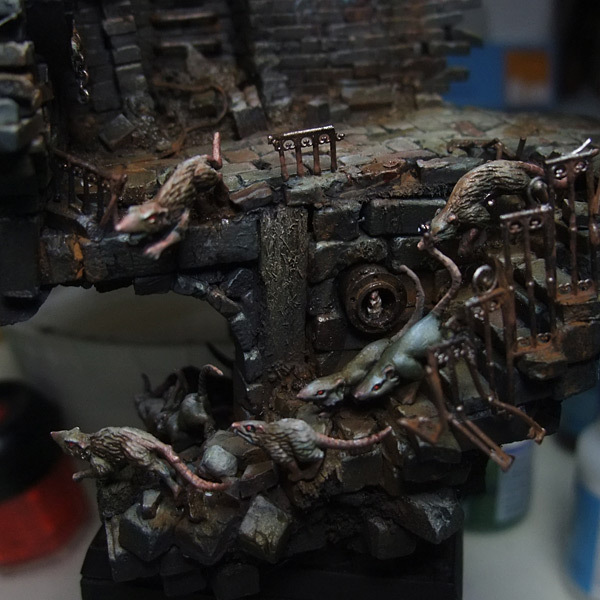 The rats were then painted one by one and glued on the base. To add all those little waterfalls I used cut blister foil that were then bent and glued with super glue to the place. I then added some volume to the water with clear acrylic gel. There are other ways to create small waterfalls, like this. The waterfalls were then painted with colors from the Tamiya Clear series to make them look dirty. 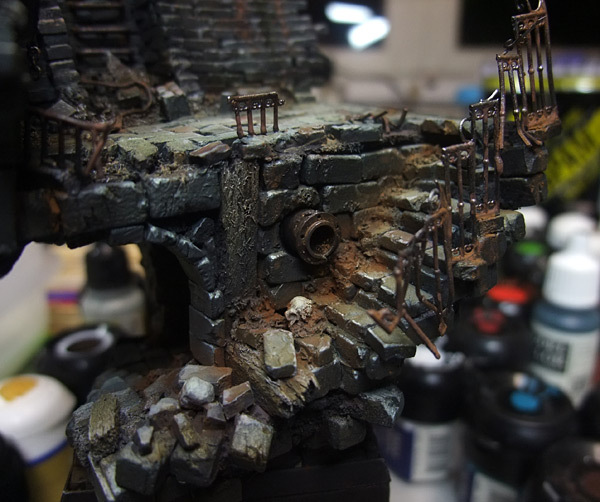 After everything was finished i decided it would be a good idea to add some moss to the scene on some spots. I'm sorry i have no step by step pictures of this but there is a tutorial in our database and you can see it on the finished photos. To finish this article, again some pictures of the finished project. 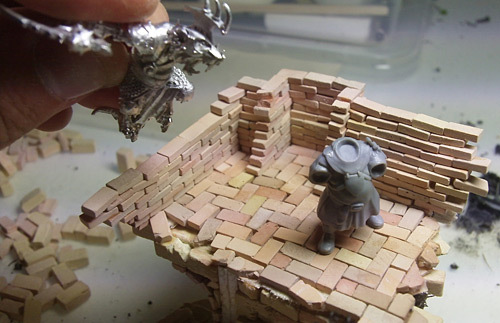 An epic piece of work deserves an epic tutorial like this. Thank you! Wow, astonished as always. Only one question keeps torturing me, were do you find all those fancy fences? Nice! Donation sent. Its not much, $40, just pick up half of it from Roman. Hopefully others appreciate all your time and effort in writing this as well. Folks, hit the donation button. Hit it hard! A great tutorial with a rare inside view on how to build such a project. I love it. I really do :-) Just as much as I love the project itself. @ Roger VS: They are from Busch, as it says in the tutorial too. Amazing tutorial, more than amazing result! Thank you very much for it. If there are any skavens (well I hope that there aren't any), they must be like these ;-). Great article! I have donated quite a few times now, and for a good reason, this blog is ace and entertains/inspires me no end! Spectacular work and a very interesting article. I'm sure everyone appreciates the work you put in. You have made an excellent looking piece, I especially like the nose-mining ogre. I was wondering what you used for your bricks? Did you make them yourself or find them online somewhere? Simply amazing the fire of the flame thrower it' really true, and the Warpstone are really cool !! how did you realize that great effect of fluorescence? Ugh you just made me order a whole bunch of Juweela bricks! We feel sorry, but you will see that you are doing a good thing for your hobby joy! This is an epic piece of work. Great, Great Job done there. I love the conversion of the ogre and the actual place where it is set. I also love the rats and the skaven warlord. Basically, I love everything! EPIC!